Lately, the rumor mill has been pretty spot on, as I mentioned with the announcement of Nikon’s full frame mirrorless cameras. But although I knew what was coming at today’s live event with the DJI Mavic 2 drones, the hardware spec really wasn’t the exciting part. It was all the cool new flight modes that bring some old school camera techniques to aerial cinematography. That’s the hardware set, and as you can see, there is what you’d expect from DJI with a new product announcement. Steady improvements in GPS enabled control, obstacle avoidance, and expanded flight times. WiFi connectivity is also improved thanks to DJI’s OcuSync 2.0, which chooses between 2.4 Ghz and 5.0 Ghz wi-fi bands that have a stronger connection and separates telemetry and video signals to keep a more consistent signal. The result is an 8KM range (which really isn’t all that big a deal here in the states, since we have to keep our drones within line of sight). 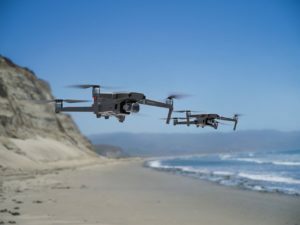 The Mavic 2 drones also sport omnidirectional obstacle avoidance, which will see that it’s heading towards a potential crash, and recalculate your flight route to both avoid the obstacle and keep your subject within the frame. DJI also has added features that take advantage of the Mavic 2 Zoom’s 24-70 optical zoom lens. The first is Dolly Zoom mode. You know, that iconic reaction shot that was made famous by directors like Alfred Hitchcock and Steven Spielberg, where you zoom in and dolly out. In Dolly Zoom mode, the Mavic 2 Zoom will automatically flight a dolly back route, while zooming in the lens to compress the image for a very smooth and professional look that before now, was only pulled off by a seasoned drone pilot and cameraman. 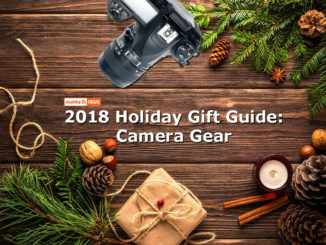 The other feature, combines the 2x 24-70 optical zoom lens with the 2X digital zoom to create a longer, hybrid 96mm telephoto lens shot that captures in full HD without loss of resolution. Hybrid autofocus uses phase and contrast detection for keeping your focus sharp, and can focus 40% faster than in the previous Mavic Pro. 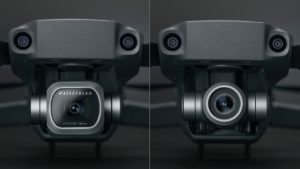 Not to be outdone, the Mavic 2 Pro, offers 10-bit D-Log-M color profile for four times the color gamut, and up to 12 stops of dynamic range. It also offers HDR support and has a cool stitching feature which enables you to shoot up to nine different aerial images of your landscape, and then the Mavic will stitch it together in camera and download an impressive 48 MP master image. 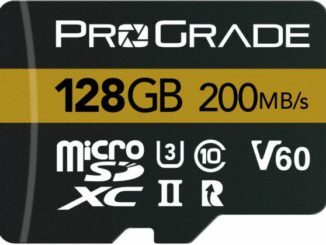 Ideal for landscape photography. Both drones also have intelligent flight modes including Circle Hyperlapse, Course Lock (for keeping your camera fixed on a subject while the drone flies straight), WayPoint for creating complex flight paths incorporating altitude and GPS coordinates, and Free flight mode to fly fast and loose why doing more complex camera shots like hyper lapse. And in what could be my favorite feature because it’s so simple, the Mavic 2 has a bottom auxiliary light that will turn on when coming in for a landing, so that the pilot can see his landing pad in fading light. As a private pilot, I love that. Prices break down as follows: The Mavic 2 Pro is $1449, and comes complete with drone, battery, remote controller, charger, and four pairs of propellers. The US retail price of a Mavic 2 Zoom, including the drone, battery, charger, remote controller and four pairs of propellers, is $1,249 USD. 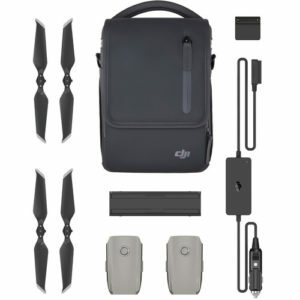 DJI has also unbundled the Fly More Kit, so you can now purchase it separately, and for $319, you get two additional batteries, a multi-battery charging hub, a car charger, a battery to power bank adapter, two pairs of propellers and a carrying bag. 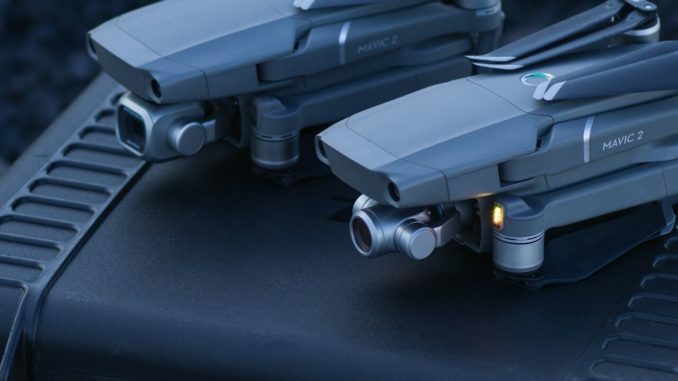 There are some, however, that are annoyed with the fact that DJI has chosen to split the feature set of the Mavic 2 into a pair of drones, rather than one. Much like the last chapter of a long awaited epic movie saga, the creators opted to split the final story into two, in order to offer twice the detail (at twice the price). And those critics aren’t wrong, I agree. It’s a bit annoying to have to lay out $3,000 in order to get all the features that are stacked into these two models. But as a filmmaker, I think most won’t hesitate to must go with the flow and get both for when they have the need. We’re used to such things. On the bright side, DJI also has started up a trade in program, so you can trade in your old drones for a better price on your new Mavic 2. Both drones are available today from DJI.colm and flagship DJI stores. For more information on all the new features and capabilities of the Mavic 2, please visit https://www.dji.com/mavic-2.